Today’s article will be about the coolest upcoming event in Vancouver. 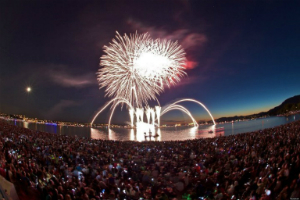 Yes, it’s true and it’s called the Honda Celebration of Light! 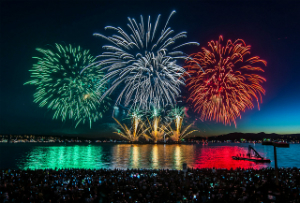 The Celebration of Light is a fireworks competition, and this year, it will be featuring three countries: the United States, France and Japan! It will begin at 10:00 PM sharp, rain or shine, from English Bay. • Saturday, July 26 – Team USA by Pyrotecnico. • Wednesday, July 30 – Team France by F.C. Pyro. • Saturday, August 2 – Team Japan by Akariya Fireworks. The winning country will be announced on Monday, August 4th. “What is the best spot to watch the fireworks?” you may ask. So here is a nice list of the top notch spots where you should go if you want to watch the fireworks! So if you are cheering for team USA, France or Japan, come and enjoy this magical event! If you need further information about the event, you can check out http://hondacelebrationoflight.com/! I’m sure you will find everything you may need.